Soft, fresh homemade White Wheat Burger Buns make any sandwich a little more special, perfect for burgers, pork, chicken and turkey. Whenever the urge to bake bread arises I always try to indulge it, since one day I hope to be a master bread baker and no longer frequent my local Publix bakery when in need. Few things in life are as good as warm fresh bread and what better way to enjoy your lunch than on a freshly baked bun?I ate mine pilled high with pulled pork and BBQ sauce, but these buns make a great vehicle for any sandwich your heart desires. Double the recipe and freeze the leftovers for up to 3 months and the next time you need fresh bread you’ll avoid a trip to the store. Enjoy and happy baking! In a small mixing bowl whisk together the water, milk, honey and sugar, add the yeast and let bloom for at least 5 minutes. In a large mixing bowl combine the 1 c all purpose flour, whole wheat flour and salt, using a wooden spoon stir in the egg, yeast mixture and olive oil. Add the remaining 1/2 c all purpose flour and stir until the dough comes together. Turn the dough out onto a floured surface and knead until it is smooth, about 8-10 minutes, you may need to add extra flour if it is still a bit sticky. Shape the dough into a ball and place in an oiled mixing bowl, cover with plastic and let rise in a warm place for 1-2 hours. Shape the dough into 6 equal buns, cover again and let rise 1 hour. 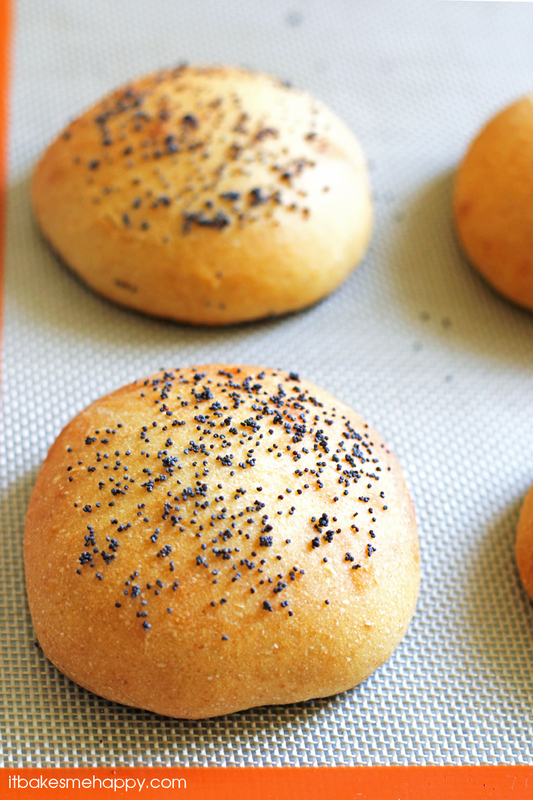 Preheat your oven to 400º, coat the buns with coconut oil and sprinkle on the poppy seeds. Bake for 15 minutes, until the buns are golden brown and the bottom is lightly browned, cool on the pan completely. Slice and serve garnished with your favorite sandwich fixings. I just had my first encounter with yeast making homemade bagels last weekend. These buns look amazing! I am a new follower and found your blog through the GYBN party. I’m with you on the bread. Don’t think I’ve shop bought bread in months. It’s so much fun! These look pretty tasty as well, love the decoration on top, is that poppy seeds? Emily, these look awesome!!!! Pinning! Pinning this. I love the poppyseeds on top! I love homemade burger buns, especially with pulled pork. Thanks for sharing Emily! These look so wonderful. I am definitely trying this one. I am too determine to become a bread baker. Nothing like bread baking in your own oven. Hi Emily! Just stopping by to let you know that I will be featuring these at tomorrow’s party. Thanks again for sharing at Marvelous Mondays! These look great, Emily! I’ve never thought to make my own buns before, but you make it sound so easy 🙂 Pinned!